1.5 UPDATE WITH NEW FEATURES! READ MORE BELOW! You're the hungriest frog there ever was at an All You Can Eat buffet. See how many courses and servings you can get through while the Chef watches on in horror! Use your utensils for food on plates, and your hands for the rest. But avoid the frog legs, that might be your cousin! "A" switches between your utensils and your hands. Use the left and right arrows to move to the food as it comes rocketing towards you. The Frog has eaten some bugs! The Chef has added some features! - Leaderboard: challenge your friends on the Wall of Gluttony to see who can cause the most Chef despair. 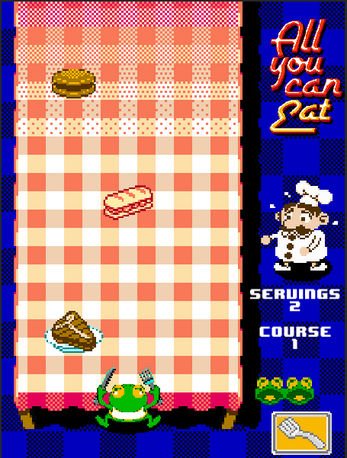 - Evened out difficulty curve: like eating the Chef out of house and home? The speed curve of the food has been adjusted so the best of you can eat forever. 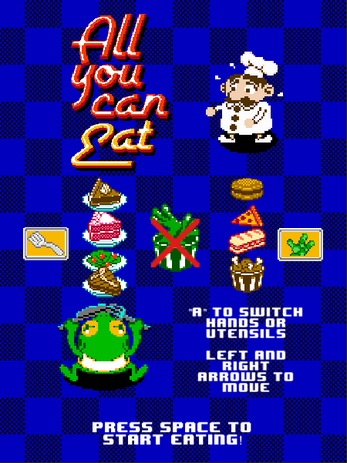 And each course adds two more servings for the insatiable Frog to devour! - Tweet Your Score: brag to your friends about your gluttony. - Game Over music: know how badly you've failed with a new musical flourish! - Hit sounds: know how much it pains you to lose a piece of food with a new musical flourish! - Fixed animation bugs: they're better, the Chef swears. - Chef Despair: has been upped. Considerably.